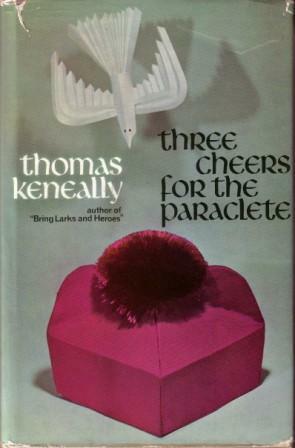 Winning Australia’s most prestigous literary prize two years in a row is an impressive accomplishment, and that’s what Thomas Keneally did in 1968 when his fourth novel Three Cheers for the Paraclete won the Miles Franklin Award. So what’s a paraclete? I had no idea either, so I looked it up online. Wikipedia says that ‘Paraclete comes from the Koine Greek word παράκλητος (paráklētos, “one who consoles, one who intercedes on our behalf, a comforter or an advocate’, and the Catholic Encyclopedia says it’s ‘an appellation of the Holy Ghost’. From the moment he allows his young cousin and bride to spend the night in his room, Father Maitland causes raised eyebrows and dark mutterings amongst the brothers at St Peter’s. Time and again his efforts to do the right thing for his fellow men lead him into conflict with his superiors and the immutable laws of the church – a conflict which ultimately threatens to destroy him both as a priest and as a man. Thomas Keneally’s darkly satirical novel, which won him his second successive Miles Franklin Award resounds with intellect and humour. On Saturday evening, Maitland had to say Mass on a headland for a guild of graduates. The occasion had been arranged in the heat of early March, but on the afternoon itself dusk was all cold light and fierce winds. The altar cloths had to be tacked down, a truck had to be driven to the weather side of the altar lest the chalice and chalice veils blow away. The Mass proceeded under a sky dark as plums. The sea raced in obliquely, breaking on his left, and wraiths of spray infested the hill. He enjoyed the occasion and was happy when turning to speak to these people who half-lay to hear him. They reclined on rugs and ground-sheets as if they might well be preparing to drink coffee from a thermos or make love. This somehow gave him the sense that what he performed had an affinity to the earth and the elements and the blood. So that, for the first time since coming home at Christmas, he did not feel an alien.